We are desperately sad to have to tell you that our dear little tough guy, Arnold, has died, aged just 21 months. Although small, Arnold was a strong little chap, with well developed muscles - hence his name - and such a character. 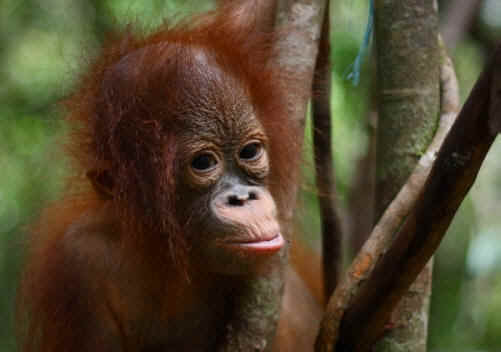 He arrived at Nyaru Menteng in May 2008, aged just 9 months, his mother having been brutally killed on an oil palm plantation. Arnold became ill a few days ago and was taken to the clinic at Nyaru Menteng, suffering from cramps and epileptic seizures. Despite the best efforts of the vets and medical team, however, he had contracted a form of meningitis, and succumbed to it in the early hours of April 16th. Hearts are breaking all over Nyaru Menteng this week as the staff mourn the loss of Arnold. 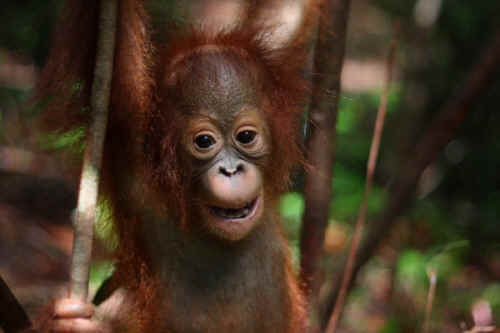 Having spent the past year in the baby group at Nyaru Menteng, Arnold was a favourite with most of the babysitters. “He is our little prince,” said Hanni, with such love in her eyes. His death is a great loss to her, to Siti, and the whole team of babysitters, as they have cared for Arnold day and night since his arrival at Nyaru Menteng, and they have loved him as if he were their own child. Arnold fitted so well into the baby group, and he leaves a great empty space. He’ll be especially missed by his best friends, Chili and Pickle - the three little orangutans having played and climbed together as soon as Arnold was strong enough to join them. Often, he couldn’t keep up with them, but Chili and Pickle loved playing with him, treating him almost as a younger brother. Our only small consolation is the knowledge that in the absence of his mother, he received so much love and care from the babysitters during his all-too-brief time in this world. We shall all miss you, Arnold. We gave you a year of love, tenderness and great care. Rest in peace, little chap. We’ll always remember you. Illegal logging and the development of palm oil plantations continue to reduce forests every day, leading to the extinction of Orangutans.